‘Achievements’ allow you to load an icon or picture (known as a ‘Badge’) that indicate that your Learner has achieved a certain goal by reaching and completing a page. To open the ‘Achievements’ feature, press ‘Page Settings’, then press ‘Achievements’. 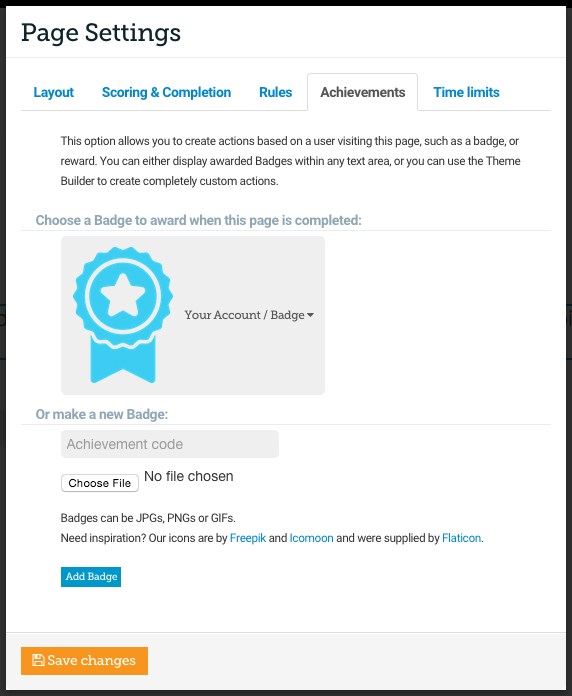 ‘Choose a Badge to award when this page is completed’ - Here you can choose from previously uploaded Badge images or preset icons. ‘Or make a new Badge’ - Here you can choose your own image. Enter a name, select the image to upload and then press ‘Add badge’. Once you have completed the steps above, your achievement will have been set up for this page, but won’t be visible. You will now want to add your image to appear somewhere in your project (this could be absolutely anywhere, a trophy cabinet style page, a hall of fame page, whatever you choose) this is done by inserting them into the text of the page. If your image is ‘Greyed out’ then this is because the particular page that the achievement has been set to has not been reached yet. 💡 Please note! Badges are not stored between learner sessions.